After a hard day in the hills, there's nothing quite like a good curry to revive body and soul. Unfortunately, creating a quick and authentic curry while you're out camping is not the most straight-forward of tasks, even for the accomplished outdoor chef. You can, of course, take tinned curry, but cans are heavy and awkward to carry and the empty tin must be packed out again. A pat on the back, therefore, goes to HL Foods who have concocted Curry To-Go!, in five mouth-watering flavours. The makers have dispensed with the tin and packed their product in a foil sachet, making it convenient to pack and, at 350g, relatively light. Once consumed, the wrapper can simply be burned. We sampled their Chicken Tikka Masala on a recent stravaig to Skye. A mix of tender breast of chicken, cream, yoghurt, coriander and spices, we found the chicken to be of good quality and the sauce very tasty indeed. The great thing about 'Curry To-Go!' is that it is very quick to cook - it just takes six minutes to heat the contents of the pack through in a pot, and it's ready to eat. We combined the curry with a pack of Bachelors' spicy rice, complete with mushrooms and an assortment of vegetables. The rice took around 20 minutes to bring to fruition. Once drained, we popped it in a plate, covered it with a tea-towel and heated the rice through. The rice then went back into the pot where it was mixed into the curry for a final couple of minutes on the stove before dinner was then served. A quick look at the list of ingredients shows Chicken To-Go! contains no dreaded E-numbers and plenty of natural stuff - such as chicken, chopped tomatoes and double cream. Storage is easy too. Chicken To-Go! doesn't have to be refrigerated, just kept in cool, dry conditions. 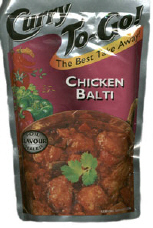 It's available in five varieties - Chicken Korma, Chicken Tikka Masala, Chicken Madras, Chicken Balti and Vegetable Tikka Masala and costs around �1.99 a pack (each pack provides a generous serving for one). Typical values per 100g - energy: 766KJ/183kcal, protein: 9.6g, carbohydrates: 11.4g, fat: 11.4g. Curry To-Go! is made by HL Foods Ltd, Bridge Road, Long Sutton, Spalding, PE12 9EQ, and is available from Safeway and other leading supermarkets.